I love taking a classic recipe, like honey bourbon chicken, and putting a little twist on it to make it unique. I have been making oven baked honey bourbon chicken for many years now. And before you stop reading, please understand that this recipe has absolutely no bourbon in it at all! Instant Pot Honey Bourbon chicken with a slice of orange on top. The classic dish was actually said to be created on Bourbon Street in New Orleans. Hence the Bourbon name. However, I have seen a few recipes that actually include Bourbon as an ingredient, but most honey bourbon chicken recipes have absolutely no alcohol in it at all. So when I was asked to make a chicken dinner a few weeks ago, I decided that it was time to try at my hand at Instant Pot Honey Bourbon Chicken. It was entirely too hot to turn my oven on and I have always had good luck with chicken recipes that I made in the Instant Pot. 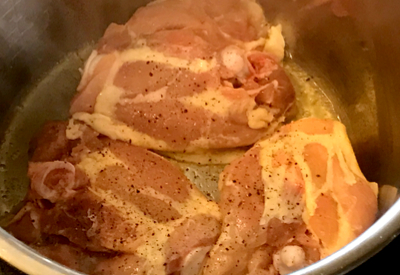 I had just made one of my favorite recipes – Instant Pot Cajun Chicken, and I was looking for a new recipe to try. So I pulled out my classic honey bourbon recipe and decided to give it a shot. Bone in chicken thighs provide better flavor and tenderness than boneless chicken. I prefer to make most chicken dishes with bone in cuts of meat. The bones add so much flavor to the dish and the meat becomes extremely tender when cooked with the bone. Knowing that there needs to be plenty of thin liquid when cooking in the Instant Pot, I decided to adapt my original recipe just a bit. 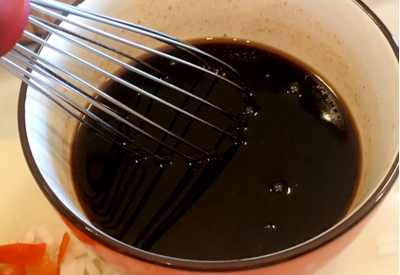 Of course I continued to use the classic ingredients of soy sauce and honey as part of the liquid ingredients. But I wanted to avoid using ketchup that most recipes call for. 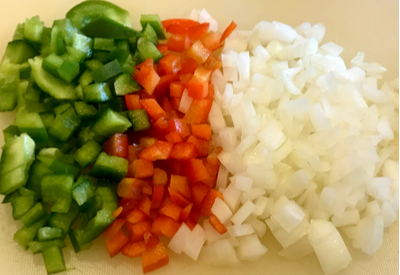 Diced peppers and onions provide an extra depth of flavor to this recipe as well. There is just too much high fructose corn syrup and sodium in most brands found in the grocery store. Instead, I decided to use Sriracha sauce. This not only adds additional liquid to the recipe, but it also adds another depth of flavor that is unexpected, yet delicious! Because I wasn’t able to add as much Sriracha sauce as I would when I use ketchup, I had to find an additional thin liquid ingredient to make sure that the Instant Pot would come to pressure adequately. In order to keep a good balance of heat and sweetness to the Instant Pot Honey Bourbon Chicken, I decided to add a little fresh squeezed orange juice to the mixture. added Sriracha sauce and fresh squeezed orange juice. WOW – the combination of flavors turned out PERFECT!!!! The sweetness of the honey and orange juice compliments the sweet and savory base of the soy sauce. And the hint of heat and chili flavor that the Sriracha sauce provides makes this chicken dish a WINNER! This recipe is versatile and can easily be made in the 3 quart, 6 quart, or 8 quart Instant Pot models. A twist on the classic orange honey bourbon chicken recipe with an added hint of heat and orange sweetness. 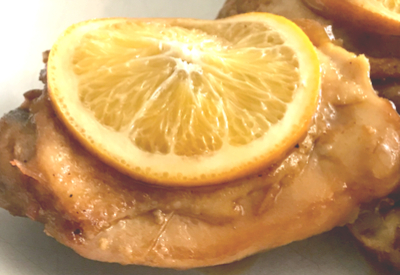 Cut any excessive fat or skin off the chicken thighs. Season each side with salt and pepper and set aside. In a medium bowl, mix together the soy sauce, Sriracha sauce, the juice of half of a large orange, minced garlic cloves and 1 cup of honey. Set aside. Turn the Instant Pot on Sauté. When the display reads HOT add 1 tablespoon of olive oil. Brown the chicken thighs for 3-4 minutes both sides in batches, adding additional oil as needed. Remove the chicken from the pot and add the additional 1 tablespoon of olive oil. Add in the diced onions and bell peppers and sauté for 3-4 minutes until slightly tender. Add in the liquid mixture and using a wooden spatula, Scrape the bottom of the pot to remove any bits that are stuck to the bottom of the pot. Turn the Instant Pot Off/Cancel. Add the chicken thighs directly in the liquid mixture. 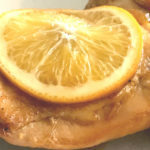 Slice the remaining half of the orange and place one orange slice on top of each piece of chicken. Add the lid and place in the locked/sealed position. Pressure Cook/Manual on High Pressure for 12 minutes. When the Instant Pot is finished cooking, allow for 10 minutes of natural pressure release, then release any remaining pressure with a quick release. Optional – You can thicken the remaining sauce that is in the pot by scooping out one cup of the liquid into a bowl and whisk in 2 tablespoons of corn starch. Add the mixture back into the pot on cook on Sauté mode until the desired thickness has been reached. Pour liquid over chicken when serving. For a less spicy version, substitute ketchup for Sriracha sauce. You say to make sure there is enough liquid, you add fresh squeezed orange juice, but didn’t include it in the recipe. With no more than what you have listed of liquid, this dish will burn. Please correct and send me the revised recipe, as it sounded and looked good. Where’s the bourbon in this recipe? There is no actual bourbon. The recipe is named after Bourbon Street.